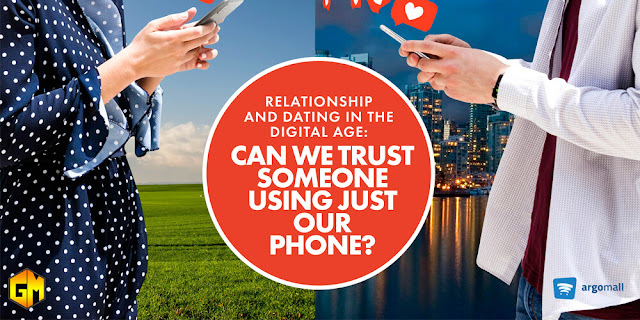 Home / argomall / digital / online / Dating in the digital age: Can we trust someone using just our phones? Dating in the digital age: Can we trust someone using just our phones? Why weren't you answering your phone? !, This is probably one of those lines that we fear the most coming from our significant other. What's another one, you ask? Try replacing 'answering your phone' with 'replying to my messages' and you get the picture. While this might be a simple scenario, this is also one example of how miscommunication (or no communication) can ruin or nurture a relationship. And one of the solutions to this problem might just already be in your pocket. See, the mobile phone has come a long way from being just a calling and texting device. It is a full-fledged communication powerhouse that has become an extension of ourselves. A few decades ago, not being able to answer your phone meant probably not hearing it ring or having low battery. Nowadays, not getting back to someone means you probably ignored that person on purpose. Two decades ago, back in the ancient times that is 1999, mobile phones were reserved for either the businessman, the ultra-rich, or the ultra-geek. While it has started to be more of a common sight thanks to the then-industry leader Nokia (right?? ), it was still mostly seen as a luxury rather than a necessity. Dating back then, consequently, was still done by way of the good, old "I'll pick you up at 7pm and let's go to the movies". There were no Facetime, WhatsApp, or FB Messenger to replace our conversations. We actually need to plan ahead and just have to talk to our partner the entire time. Imagine that. While mobile phones are plenty useful already in and of itself, the truly seismic change came when it evolved into what we now call as the smartphone. With infinitely more features, it transformed the smartphone into a full-fledged communication tool. “After a seemingly slow start, the way smartphones changed our lives was nothing short of incredible. It literally changed how humans acted in just a few short years,” shares Holub, who also has more than 20 years of professional experience in the mobile phone industry. This seismic shift allowed us to be more in touch with our loved ones. Now, we can talk to our family members abroad whenever we want, work remotely, and of course, be much closer to our partner than ever before through video calls. It's like we're always with them, right? Well, not quite. See, along with the countless innovations came the new cultural problems. Digital communication allowed people to skip the face-to-face meetings, which meant that certain nuances of human communication such as the slightest change in facial expressions are a lot harder to see and feel, which made trust and authenticity a huge issue. How can you trust someone you're talking to if you're not physically with them? It starts off with realizing that digital messaging and chatting cannot replace actual, physical communication. While we can meet people through Tinder, Grindr, and other apps, we cannot sustain relationships without ever actually being with your partner. Digital communication is a tool to augment our communication efforts, not the main platform. If we have managed to build trust with our partners in the physical world, then we would need to agree on specific guidelines in the digital world as well. Does your girlfriend like using lots of emojis or is she more of a full sentence then a period type of girl? Does he like video calls or just voice calls? Every relationship is different, so talk it out with your partner and agree on your "smartphone rules". Btw, make sure that the smartphones you're both using are authentic and reliable. The last thing you need is your knock-off phone dying on you during a call. Only buy authentic phones in trusted online retailers like www.argomall.com, which offers an invoice, local product warranty, and an official receipt for all purchases. While there are quite a few challenges when it comes to building trust and authenticity in the age of digital communication, it is no doubt one of humankind's greatest innovations. And if used properly, it can also take your relationship to even greater heights. Just always remember to charge your phone.